Ancient Sanctuary is a Booster Pack, which is a combination of the Japanese sets The Sanctuary in the Sky and Pharaoh's Inheritance. It has been released in the Yu-Gi-Oh! Trading Card Game (TCG) in English, French, German, Italian, Portuguese and Spanish and in the Yu-Gi-Oh! Official Card Game (OCG) in Asian-English and Korean. This series is the last mainstream Booster Pack in the TCG, Asian-English and Korean, prior to their convergence with the Japanese Booster Pack releases. As such it is the last to follow the format of having 2 Secret Rare, 10 Ultra Rare and 10 Super Rare cards. This is one of the two Booster Packs combined into Dark Revelation Volume 2. Ancient Sanctuary focuses mainly on Fairy-Type monsters, including the "The Agent" monsters, which have powerful effects when the card "The Sanctuary in the Sky" is in play. 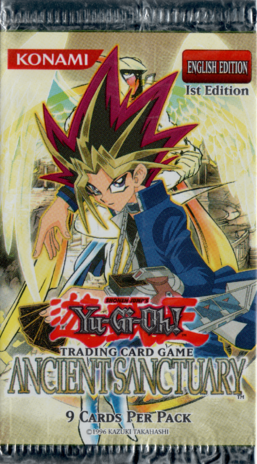 Yami Yugi's appearance on the cover of this booster pack is taken from the title page for Yu-Gi-Oh! Duelist Duel 148. This was also used earlier for Struggle of Chaos and Duelist Legacy Volume.5. In the TCG and Asian-English versions of this set, each pack contains 9 cards and each box contains 24 packs. In the Korean version, each pack contains 5 cards. This page was last edited on 7 January 2019, at 12:57.